U.S.-based market intelligence firm Transparency Market Research has released a new report on the specialty and high-performance films market. Titled ‘Specialty and High Performance Films Market for - Global Industry Analysis, Size, Share, Growth, Trends and Forecast, 2013 - 2019’, the report predicts that the global high performance films market will reach a value of US$42.21 billion by 2019. Specialty and high performance films are put to use in a variety of industries, such as packaging, automotive, electrical and electronics, personal care products, construction, and others. Packaging took up a dominant 65% market share in 2012, and is expected to remain the market leader from 2013 to 2019. The report considers increasing demand from the packaging industry and the strong rise of the photovoltaic industry as the major drivers for the specialty and high performance films market. In light of increasing environmental regulations, the nascent development of biodegradable and water-soluble films is the major market opportunity to look out for. The high performance films market is dependent on the production of crude oil, which is neither a stable industry nor environmentally friendly. Hence, the fluctuating prices and volatile political permutations around the crude oil industry are expected to be the major restraints on the specialty and high performance films market. The report classifies the global high performance films market according to type of product, end use, application, and geography. Five categories of products are analyzed: polyester, nylon, fluoropolymer, polycarbonate, and others. 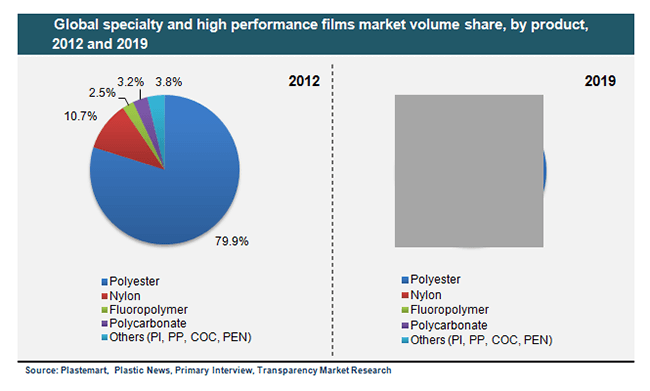 Polyester is the overwhelmingly dominant product category, with a market share of almost 80% in 2012. Physical properties of polycarbonates such as high impact resistance and low reactivity to chemicals have given rise to demand from various industries. Polycarbonates are expected to be the fastest growing segment. According to application, five sections of the specialty and high performance market are formed: barrier, safety and security, decorative, microporous, and others. Barrier films are used in packaging and consequently take up about 50% of the global specialty and high performance films market. Light control films, which are included in the ‘others’ category due to their low market share in 2012, are being increasingly used in automotive and construction industries. They are expected to show the highest growth rate. Regionally, the report looks at four regional submarkets within the global specialty and high performance films market: North America, Europe, Asia Pacific, and Rest of World. The specific share of each end use industry, application, and product type in each regional submarket is elaborated upon. Asia Pacific is the dominant market shareholder, with a 35% share in 2012. The increasing distribution of electronics and infrastructure in rapidly developing economies such as India and China is expected to drive the Asia Pacific market for specialty and high performance films. The report also analyzes the positions of key players in the specialty and high performance films market, such as Bayer, Dow Chemicals, Honeywell, Eastman, Dupont, etc.